F# – | ?- BlogName = _. One of the things I have been working on is Genesis, a procedural content generator written in F#. 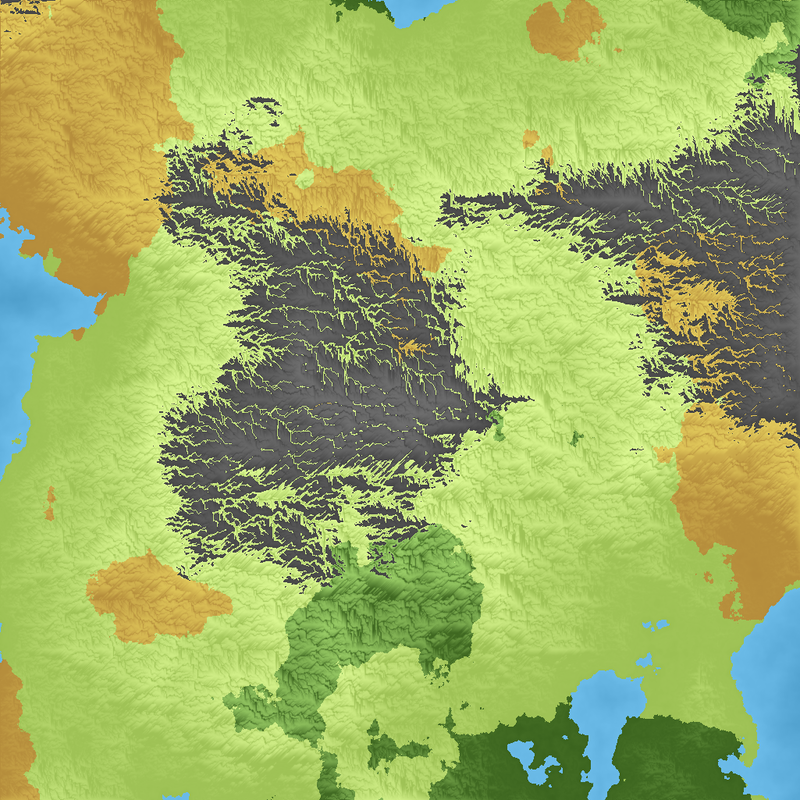 It generates random names and terrain maps. The project has almost nothing to do with what I had envisioned when I started it. 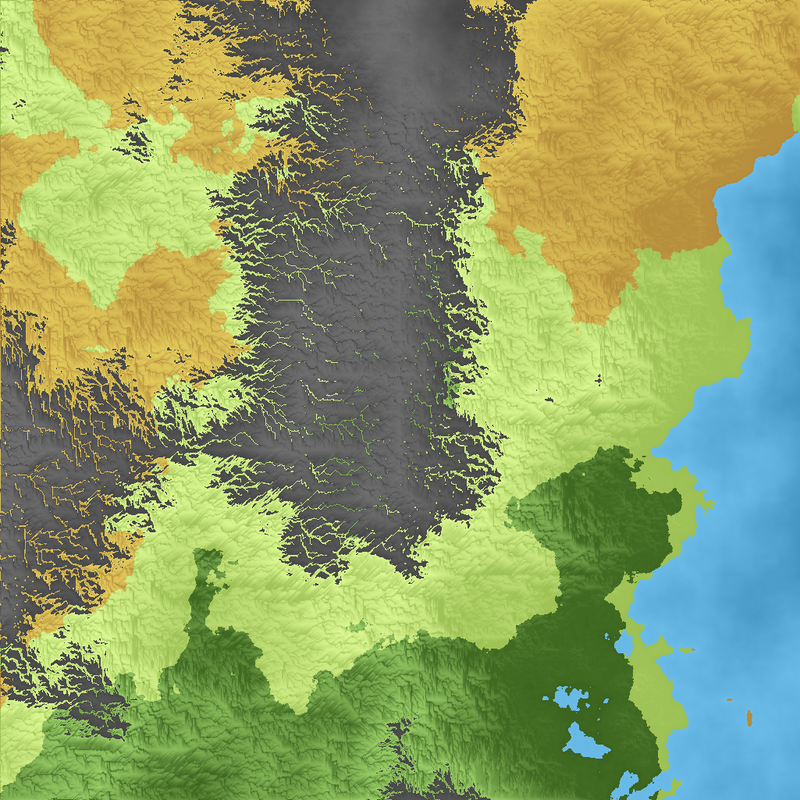 Mountains are in grey, grasslands/plains in pale green, forests in dark green, desert/arid climate in brown and water in blue. 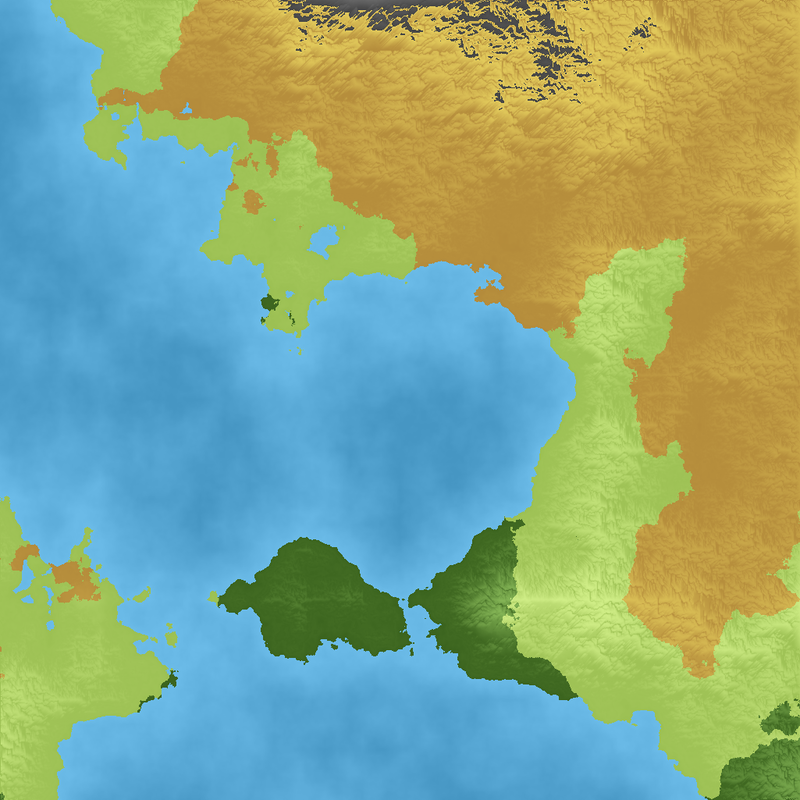 It’s still lacking rivers and lakes and the output isn’t satisfactory. 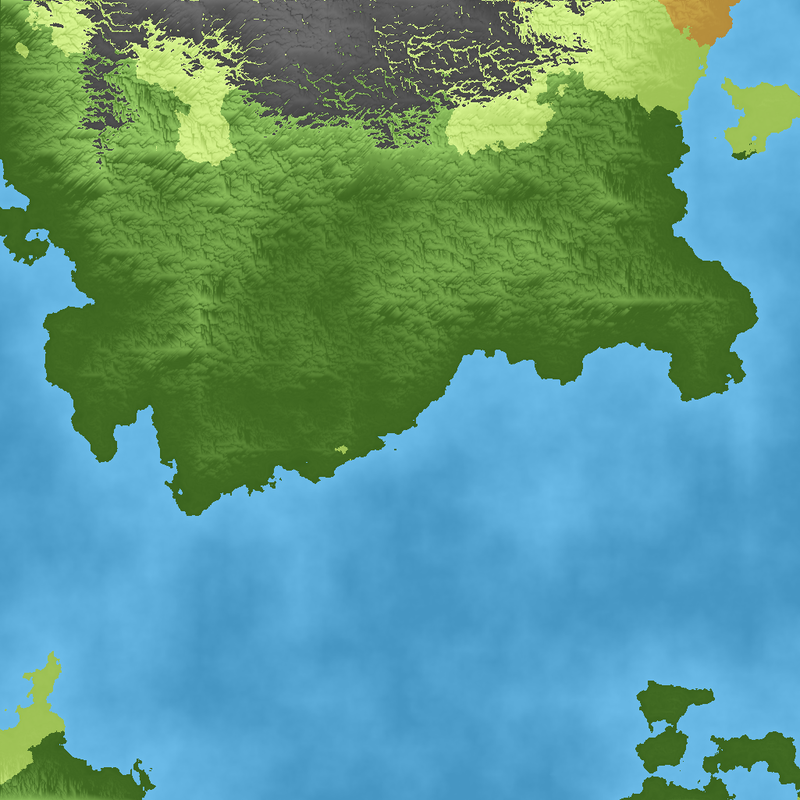 Sadly I think I would need to start over to get realistic terrain generation, which was one of my goal. The main problem is that I used midpoint displacement and noise functions which while good enough for video games don’t generate photo-realistic results alone. To try and correct that, I devised my own solution using a crude simulation of water erosion rather than look into and implement standard algorithms. It was a learning experience and a lot of fun but I would have had quicker and better results by copying some existing algorithm. I don’t know what to do with the project right now as there are other things I want to spend my time on, but I would still like to work on it some more in the future. 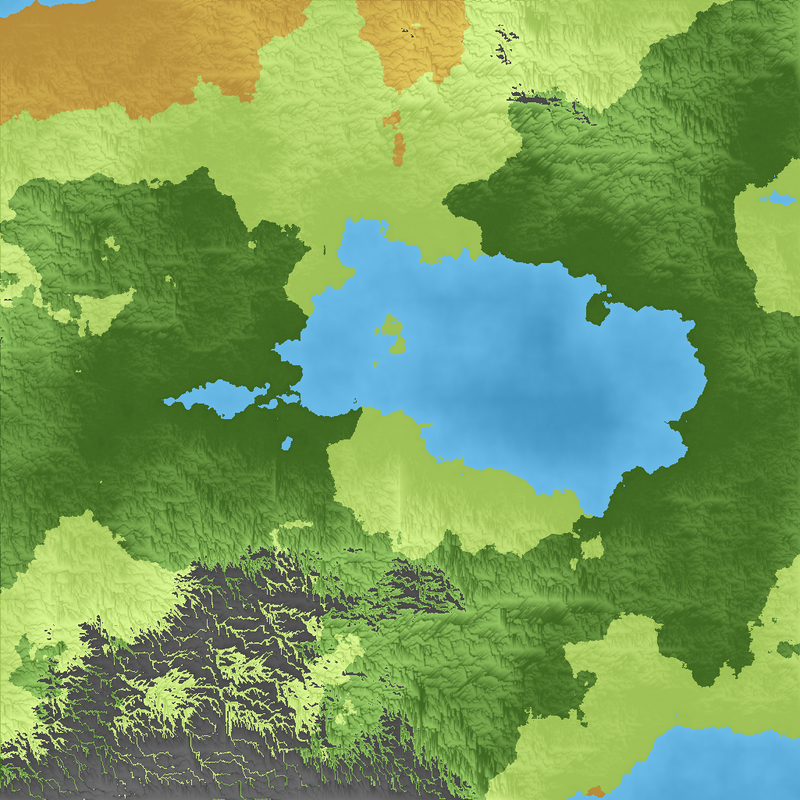 Maybe take a whole different approach and generate fantasy maps with brushes and icons which are much less detailed. There isn’t a ton of info about starting out a new F# project under Linux so I’ve decided to document how I do it. to bring up the F# compiler. You could use any editor, I chose Visual Studio Code because it offers superb F# integration when combined with the Ionide plugin. Follow the instruction and select a class library project. This will create the base project scaffolding including some files and folders. Now might be a good time to do a git init. To build your project you must use the build.sh script. If you try this now, the command will fail because it won’t be able to find the Paket bootstrapper. Paket is the package manager that downloads, installs and manages dependencies, much like NuGet, Cargo or RubyGem on other platforms. So head on over and download the latest Paket bootstrapper specifically paket.bootstrapper.exe and drop it in the .paket folder that was created by Ionide. And Paket will create a paket.dependencies and paket.lock. There should be a folder with the project name you specified to Ionide . Let’s add a new file to this project. To add the file manually you must create a new file with a .fs extension using the file system or VS Code. Next you must add your file to the project by editing the .fsproj file. Be careful, the order of the elements is important. If a file A is a dependency for file B, it must come before file B in this listing. In this example NewFile.fs can be a dependency for genesis2.fs but the reverse can’t be true. The manual technique, even though it is tedious, is useful, particularly to debug your fsproj. The alternative is to use Ionide a to add a new file for you. And select, Add current file to project. Voila! Let’s add a new dependency to our project, MathNet.Numerics, a library that provides methods and algorithms for numerical computations. Again let’s see how to add it both manually and using the Ionide plugin. Before installing any packages make sure that the .paket/paket.exe file that was previously downloaded by the bootstrapper is executable. To do so, change the permissions via the command line or the GUI. And build your project again. Twice I’ve had the project refusing to build because of the paket dependencies after a Mono upgrade. In this case your best bet is to delete the dependency info in the fsproj and add them again.